Nowbox, a 2010 YCombinator graduate, with funding from Ashton Kutcher, SV Angel, Jeff Clavier and Shervin Pishevar, is a brand new iPad app founded by Thomas Pun. Nowbox makes it easier than ever to watch YouTube videos on the go, and it’s one of the slickest tablet options we’ve seen yet. And it’s available for just an amazing a price – the app is 100% free. With the app, you can browse and subscribe to interesting YouTube channels, keep up with videos being shared on Facebook and Twitter, save videos to view later, and share what you’re watching with your followers and friends. 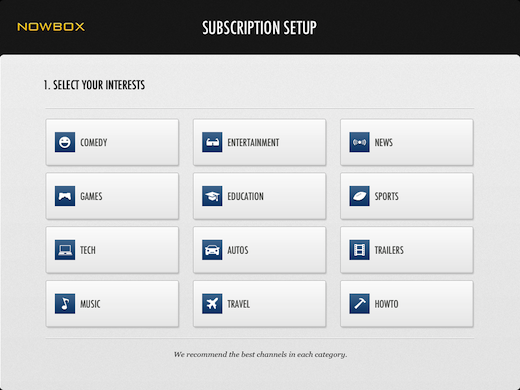 When you launch Nowbox for the first time, you can select your favourite topics, and the app will automatically subscribe to the best channels YouTube has to offer for each category. The next step is to connect to your YouTube, Facebook and Twitter accounts. 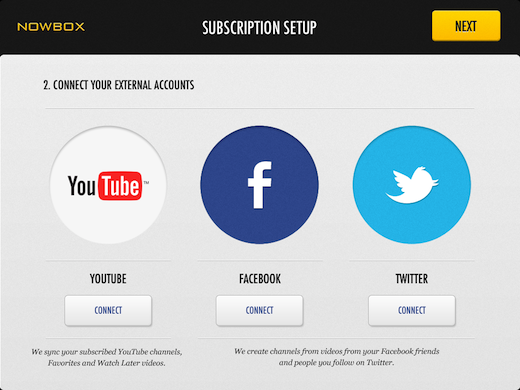 These two steps will populate your subscriptions, or TV channels, straight away. If you’d rather set up your subscriptions manually, or remove some of the suggested subscriptions, click the TV button to do so. Nowbox gives the illusion that you’re watching real TV stations with the way that the app is laid out. You can scroll through subscribed YouTube channels, as well as videos that are shared through your connected social networks. AppleTV users also have the added benefit of using Nowbox as an interactive TV guide. When it comes to watching videos, the Nowbox experience is pretty slick. You can watch videos in full screen, and while watching, you can save videos to watch later, or you can share them via Facebook and Twitter. To share a video, just hit the heart button and then you can fill in the Facebook or Twitter update with the text of your choice. While watching videos, you can swipe the screen to skip to the next one. Videos saved for later viewing are available as the top entry of your ‘TV guide.’ You can view the guide in full screen, by hitting the arrow button, and then scroll across each channel to view older videos. 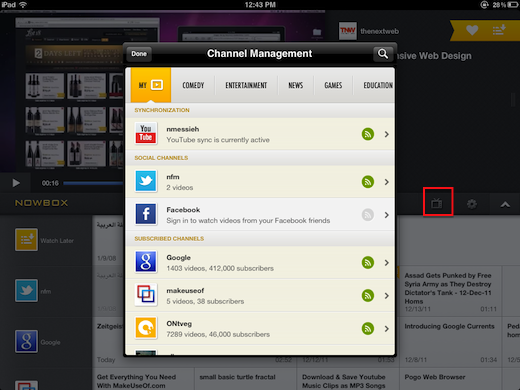 Nowbox is also running a giveaway, and you could walk away with a brand new iPad 2. All you have to do is download Nowbox, and share a video through the app.